It’s Halloween weekend! Still trying to figure out what to be? For all you last-minute ladies, we have the purrrfect solution! All you need is a few makeup products and handful of your trusty Sigma brushes. What are you waiting for? -- Get catty with this simple Halloween look! Year after year, you simply can’t go wrong with the ever-popular cat woman character. 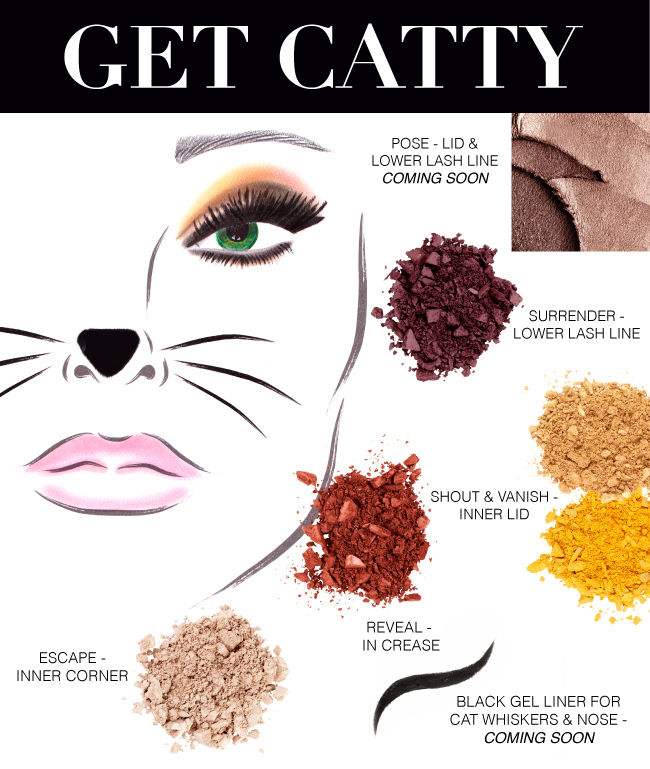 To recreate this fab feline look, take out your Dare Eye Shadow Palette and a few eye brushes. The first step is to prep lids with an eye shadow base to keep your makeup in place all night long. (Coming to Sigma soon!) With the Dare Palette, apply the shade ‘Surrender’ onto the lower lash line with a pencil brush like the E30. Blend the shade ‘Reveal’ into the crease with a blending brush (we like the E35). From there, apply shades ‘Vanish’ and ‘Shout’ onto the inner half of the lid. Lastly, use the shade ‘Escape’ on the inner corner of the eye for a slight highlight. With the E65 small angle brush and a black gel eyeliner (coming to Sigma soon! ), create a nose and whiskers. The very last step is to apply a baby pink colored lipstick or gloss. You can also use dramatic fake eye lashes to give the look extra pizzazz! Voila – your gorgeous (and fool-proof) costume! What an awesome cat look!!! thanks so much for sharing! Have a wonderful weekend!!! Ruaaaaaaarowww! *hisssssss* LOLLL!! Very cute.